Sod the Swiss - Britain will sort you out with a positively spiffing timepiece mechanism, old chap. 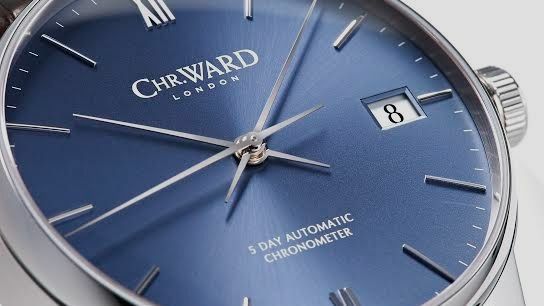 Independent London watch brand Christopher Ward has launched its new C9 Harrison 5 Day Automatic, a luxury watch sporting a movement developed in-house. A watch's movement is the mechanism within the watch, as opposed to the case and face. While most watchmakers usually stuff their timepieces with a Swiss interior, Christopher Ward has decided to challenge the Swiss status quo and develop its own unique movement. Dubbed the Calibre SH21, the new watch mechanism is claimed by the firm to be “probably the most significant watch industry development by a British brand in the past 50 years”. "Over the last decade, as an innovative British brand, we have challenged many of the norms of the cabal of huge Swiss brands that dominate the watch industry and we've put the customer at the centre of absolutely everything we do," says Chris Ward, founder of the watch brand." "Calibre SH21 gives us the platform to take our revolution further and strengthens a great British presence in luxury watchmaking." Somewhat ironically, the new SH21 movement came about as a result of Christopher Ward's partnership with Synergies Horlogères, a Swiss watch movement firm whose website boasts the line "our movements are designed, developed and entirely manufactured in Switzerland." The C9 Harrison is available for pre-order now at a cost of £1,500, with the product expected to ship towards the middle of August.